Seventeen year old Kelsey Patterson, a Grade 12 student at Confederation Secondary School in Val Caron, hopes to enter the University of Guelph in September 2007 in search of an eventual PhD in Psychology. In order to help raise money for her education, Kelsey has volunteered to participate in the Bloodstock 2006 Program with the Canadian Blood Services Sudbury Branch. According to Brandy Duhaime, Communications Specialist in Northeastern Ontario with the Canadian Blood Services, in order to meet the challenge of collecting blood during the summer months, Canadian Blood Services invites Grade 11 and 12 students in the City of Greater Sudbury to become blood donor recruiters. Student recruiters, like Kelsey, are then required to sign up a minimum of 25 blood donors who will donate between July 4 and September 1. If successful, the student's name is placed in a raffle for Education Bursaries of from $250 to $1000, to be used upon graduation from high school. For Kelsey, it has been quite an experience. 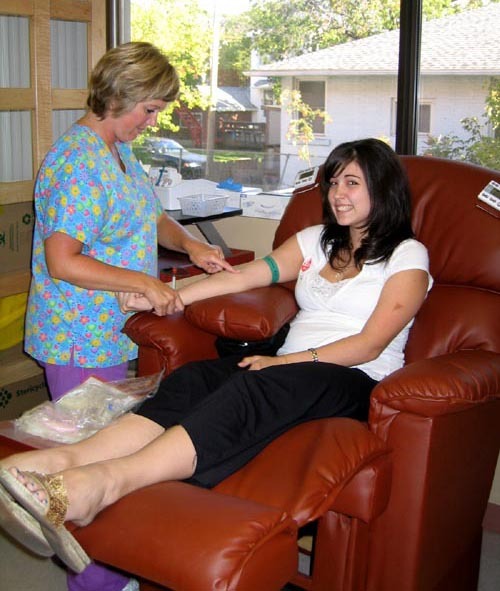 "I find it very rewarding to talk to people about donating blood. For example, one unit of blood can be used for up to three different patients. A lot of people are not aware of that. I plan on becoming a regular blood donor and will be giving my first donation on my 17th birthday." Kelsey was true to her word and is shown above with Health Worker, Shiela Gravelle, who gave Kelsey a birthday to remember. Kelsey gives the thumbs up to show that everything was great afterwards. 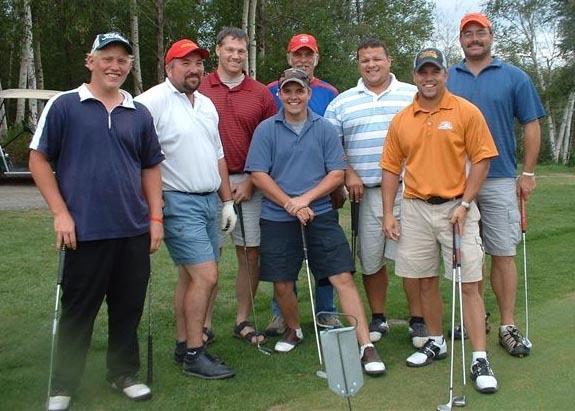 Over 72 golfers and supporters of the Valley East Cobras 'AAA' Midget Hockey Club took part in the Annual Golf Tournament on August 19, and despite getting a little wet over the final few holes, it was a day that was enjoyed by all. We have several photos to share, courtesy Gabby Laberge and Hilda Kingsley. The men's champs with a score of 63, included: Brian Beaupré and Shayne Sylvester. 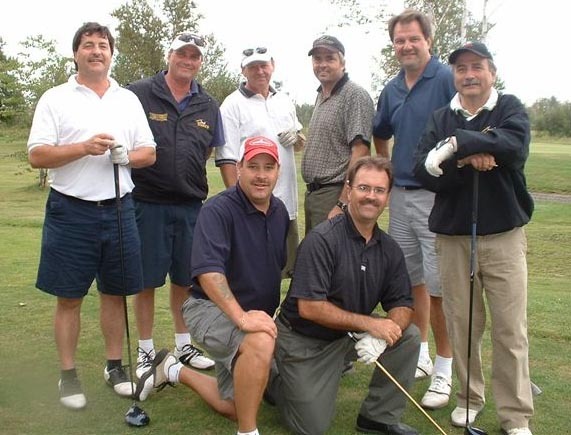 Their team mates, Jim and John Richer were missing at the time of the photo. The Confederation Secondary School French Immersion Educational Tour group is now selling tickets to the Spaghetti Supper which will be featured during the Valley East Lions Charity Days being held at the Centennial Arena in Hanmer on Saturday, September 9, 2006. Tickets are only $6.00 each. For this you get a full plate of spaghetti, salad, a bun and coffee. Companies, businesses and organizations are encouraged to consider purchasing a whole table of eight seats for only $48.00. If you are interested in purchasing tickets to support the Confederation Secondary School French Immersion Educational Tour, you can contact Gisele McCue at 969-3996. Rick Villeneuve, owner of Independent Energy Services located in the Valley East Industrial Park, is shown on the left arranging colourful brochures that were available for the public during the Corporate Exhibit whcih was held at the Hanmer Valley Shopping Centre on Thursday, August 17 and Friday, August 18, 2006. During the two day presentation, Home Comfort Specialists from IES were on hand to answer questions and provide expert advice on how to get your home ready for the long, cold winter months ahead. 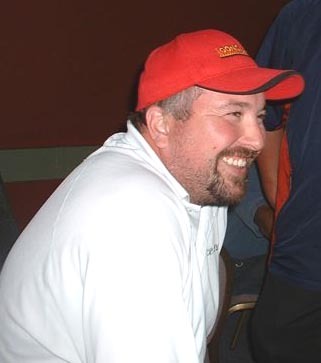 In April 2000 Rick decided to leave his 11-year position as Service Inspector at Union Energy (formerly Union Gas) to start up a Residential Plumbing and Heating business. With the support of his wife, Jody (nee Connors), Rick worked from the basement of his home in Valley East with 2-5 employees. In 2001, Rick bid on his first Commercial job at the Club D’Age D’Or in Hanmer. The Board of Directors was pleased with his presentation and awarded him the job. This large renovation quickly grew into a large mechanical project and allowed Rick to increase his workforce. The experience was a success and helped set the foundation to pursue work in the commercial market. 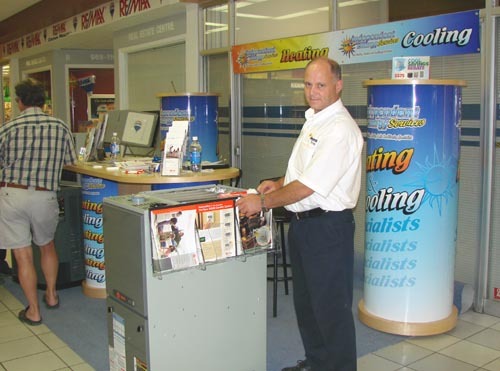 In September 2004 Rick relocated the business to the Valley East Industrial Park at 2869 White Street where Independent Energy Services, provides Plumbing, Heating, Ventilation and Air-Conditioning equipment and services to both the Residential and Commercial markets. Rick makes it very clear that he is in this business for the long term. “I believe that I have formed a sound foundation for this business and, I intend to pass it on to my sons, Justin and Joel. I am hopeful that it will be passed on for generations and that it will continue to employ and support many families within the Sudbury region as well as continue to serve our customers’ needs”. Rick and Jody used the event to introduce the community to their team of professional “Home Comfort Consultants”. All of the Home Comfort Specialists at Independent Energy Services look forward to opportunities to get out into the community to help the general consumer become more familiar with plumbing, heating and cooling systems that are on the market today. "An educated consumer makes wise choices," indicated Barry Hamilton, Sales Manager of Independent Energy Services, shown on the right in the photo at the left. 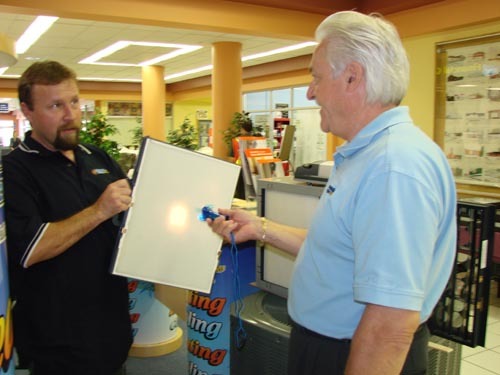 Barry especially enjoys demonstrating new products and technology to home owners who stop by to visit their corporate public exhibit. According to Barry, everyone was very interested in the TRANE CleanEffects air filtration system which uses a special technique to "electronically charge" air-borne particles in order to trap them as they pass through the cold-air return in your furnace. "This is a new product by TRANE that will filter up to 99.98% of air-borne mold spores, allergens and other particles that are known to create problems for people with respiratory conditions," explained Barry. "As the particles flow through the filter they are given an electrical charge, which then allows them to be trapped inside the system. The air that goes on to the furnace and then into the house is 99.98% particle free. With so many people complaining about allergies today, this system will go a long way to providing them with added comfort and an improved quality of life." Rod O’Grady, shown in the photo on the right, found that many people were equally impressed with information about the TRANE XR Series Air Conditioners which are built with a Duro-Tuff basepan and a state-of-the-art Spine Fin Coil. Homeowners are surprised to find out that it is really not very expensive to install a central air conditioning system in existing homes. According to Rod, most new homes being built today come with central air already installed. 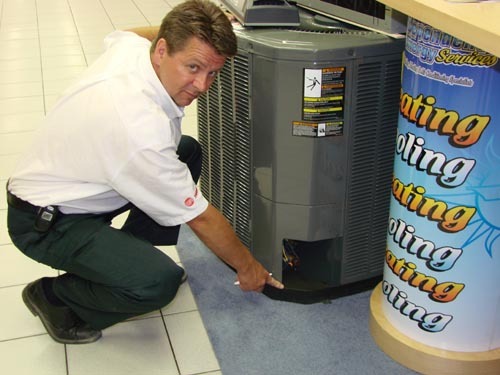 As a special offer, upgrade your existing Heating and Air Conditioning system before August 31st , 2006 and receive a $1000.00 rebate when you purchase Trane products. Offer ends August 31st , 2006 . The playoffs begin on September 1, 2006. The race is tight in a couple of divisions where teams are vying for placement for the semi-finals. The final games will be played on Tuesday, August 29, 2006. 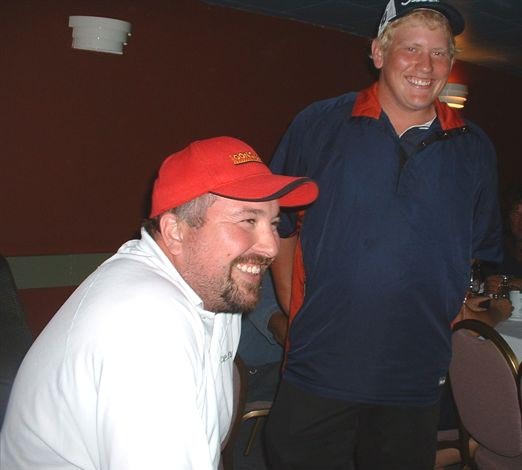 We will have the final standings and the playoff schedule posted for you on Wednesday, August 30, 2006. Check out the standings by clicking on the link below to open up a WORD document which will contain the latest standings, courtesy of Brian Beaupre. Bernie & Ron Pedneault will be approaching the first anniversary of the opening of their new store in Val Caron on October 1. It has been a great year for Fantastic Floors as they continue to establish their reputation for quality products and good, sound advice. Whether the job is big or small, you can always trust Ron to come up with excellent ideas to help you accomplish your goals within your budget constraints. One piece of advice he gives people during this time of year is that if you are thinking of doing some home renovations before Christmas, now is the time to begin looking through samples and preparing your plans. Don't wait until the last minute or you will be scrambling around and you won't be happy with the end result. Ron invites you to stop by his site in the Valley Bingo Plaza at any time to go over your plans and establish your options. He always encourages people to shop around and look for the best value because he knows that his prices cannot be beat, and he is confident in his ability to provide you with that bit of extra added value that means so much when you are renovating. 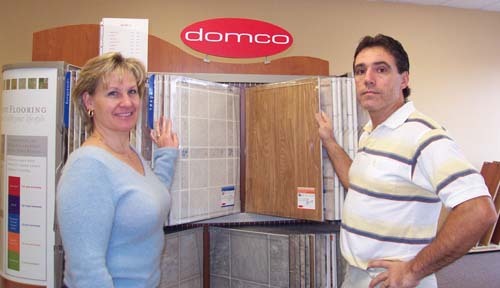 Make sure you visit their web site or call Ron today to get some more information on the Fantastic Floor experience. Caroline McIntosh, shown above in the photo during one of her visits to the Hanmer Valley Shopping Centre has introduced local residents to VoiceBio, an alternative health technique that uses one's voice print to reveal certain information about the condition of the body. 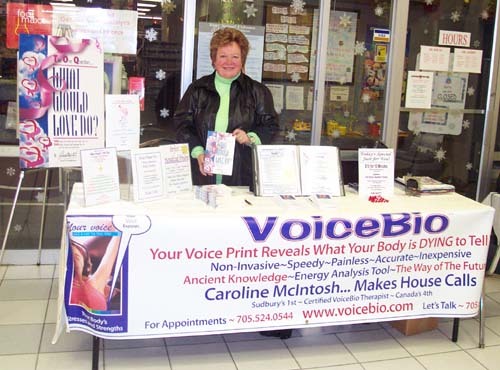 Caroline is Sudbury's first Certified VoiceBio Therapist. 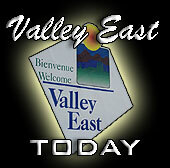 Valley East is the place to be!